The civilizations that developed in ancient Mexico in the area referred to as "Mesoamerica," had many common cultural traits. They shared similar writing systems, calendar, a ball game played with a rubber ball, the custom of building temples on "pyramids" or platforms, and agriculture (cultivating mainly corn, beans, and squash). However, they are distinct in other respects. If you'll be visiting archaeological sites in Mexico, you should know the difference between these civilizations so that you can avoid faux pas such as calling Teotihuacan an Aztec or Maya site. This primer will give you a quick overview of the different civilizations so that you can easily identify each one. The Olmecs lived along the Gulf Coast of Mexico, in the area that is now the states of Tabasco and Veracruz. This group is sometimes called the "mother culture" of Mesoamerica because it was the first group to develop certain cultural traits that were adopted and further developed by other groups. The Olmecs are known for the giant stone heads found in the area which probably represented rulers. The Zapotecs of Oaxaca were responsible for the construction of the earliest urban center of Mesoamerica, Monte Alban, around 500 BC. The site is located on a flattened mountaintop in the center of the Valley of Oaxaca. The Zapotecs had ball courts, buildings for astronomical observation and a writing system which has not yet been deciphered. Teotihuacan is located about 25 miles (40 km) from Mexico City. Its imposing Pyramid of the Sun and Pyramid of the Moon are well-known challenges for tourists to climb. Much is unknown about the city and its inhabitants, including their ethnic origin, which is why they are simply called "Teotihuacanos." Yet this was one of the largest urban centers in the world when it was at its peak, and its influence reached throughout Mesoamerica. The Maya area covers the states of Campeche, Chiapas, Tabasco, the Yucatan, and Quintana Roo, and stretches down into Central America. The Maya are well known for their advanced mathematical and calendrical calculations, as well as their knowledge of astronomy. 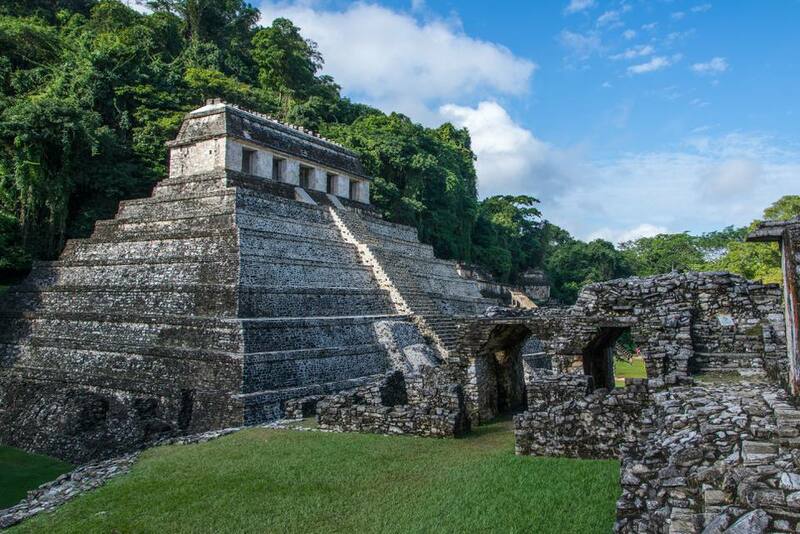 There is an abundance of Mayan ruins to discover. 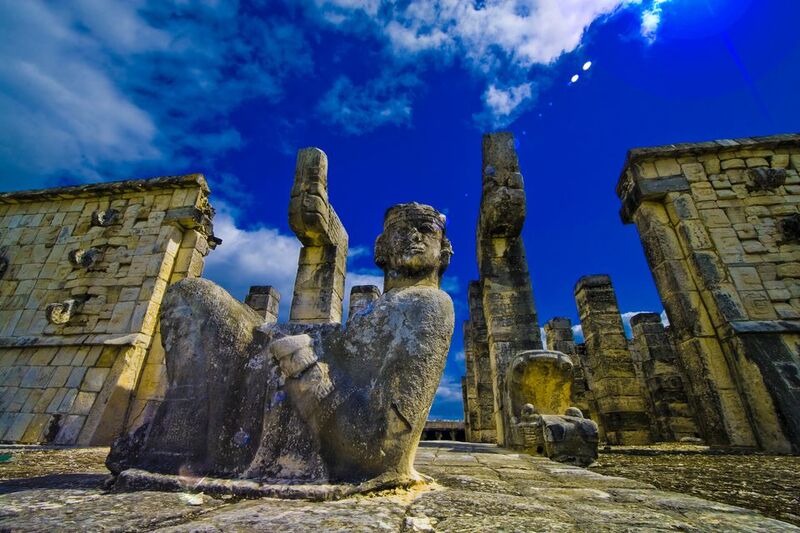 Discover the Mayan sites of the Yucatan Peninsula. After the fall of Teotihuacan (around 700 AD), the Toltecs gained dominance of Central Mexico. Their capital city was Tula, north of Mexico City in Hidalgo state. The statues of "atlantes," or warriors at the site are evidence of the war-like culture characteristic of the Toltecs. According to legend, there was a conflict between followers of the god Tezcatlipoca and those of the god Quetzalcoatl. This resulted in a split which eventually led to the fall of the Toltec civilization. The Aztecs, also known as the Mexica ("meh-shee-kah"), are perhaps the best known of Mexico's ancient cultures. They dominated Mesoamerica at the time of the arrival of the Spaniards in the early 1500s, but they had only existed as a civilization for some 200 years. The Aztecs were an efficient military power that came to power within a very short period of time. They practiced human sacrifice on a large scale. The Aztec capital, Tenochtitlan, is effectively buried under the constructions of Mexico City, however, the main temple, the Templo Mayor (Great Temple) has been excavated and is well worth a visit.